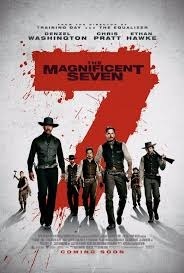 We have known about the remake of The Magnificent Seven for years now. Now as the release date draws near, Sony has given us another trailer that gives us a little more of a taste of whats to come. The film stars Denzel Washington, Chris Pratt, Ethan Hawke, Vincent D'Onofrio, Peter Saragaard, and Byung-hun Lee. John Lee Hancock (The Rookie) had a hand in scripting the film with Antoine Fuqua directing. The Magnificent Seven hits theaters September 23rd.